Maureen “Marzi” Wilson—the popular Instagram cartoonist behind Introvert Doodles—is back with a brand-new collection of hilarious, relatable, and heartwarming doodles about anxiety that show you that you are not alone. If you struggle with anxiety, you may feel like it’s you against the world all the time. Sometimes, your anxiety can be too much to handle all at once—wouldn’t it be nice to have someone around that understood exactly what you were going through? Meet Marzi! She struggles with anxiety just like you. 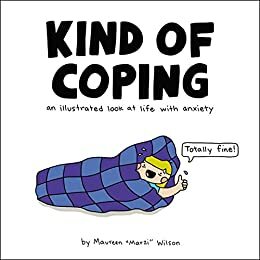 In Kind of Coping, join Marzi as she (kind of) copes with her own anxiety from day to day, finding the humor in her condition with this collection of funny, encouraging, and supportive comics that show you the best you can do sometimes is just kind of cope—and that’s totally OK! Whether it’s a panic attack or an awkward social snafu, Marzi knows what you are going through. With over 150 full-color doodles that deliver hope and inspiration, unconditional support, and big laughs, let Marzi share her journey with you. "These comics perfectly capture what it's like to live with anxiety." I follow the author on Instagram and definitely relate to her. I bought her book to not only remind myself it's okay to have anxiety but to help with friends with some comedic relief when they're struggling. There is even a part about being a friend to someone with anxiety. I found it extremely helpful. One friend in particular tends to message me when she's on the verge of a panic attack and this book gave me some great ideas on what to say to her to help. While reading this book I wanted to send photos of pages to my friends. I should probably help the author out by sending actual copies of the book to my friends. 5.0 out of 5 starsI hugged this book when I finished it! Love love love this book! It’s like a warm hug from an understanding friend. It’s a short read, but something you can return to for comfort when you feel like no one gets it. 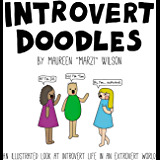 Just like the first book from Marzi, "Introvert Doodles", this one is a collection of comics and vignettes detailing the life of an introvert in a humorous fashion. Every socially awkward person can identify, particularly if they suffer from anxiety. While the first book was focused almost exclusively on humor, this new one actually takes the time to offer helpful hints, tips and ideas to help, like the title says, "kind of coping". That alone makes the book better, as it can help even further as a major helper in making other people understand the pleas of those who suffer from anxiety and social awkwardness. If you are one of those, you know it's hard for extroverts to understand. Even when they insist they do, it's clear by their actions that they don't, even if they mean well. They will insist in inviting you to large gatherings and then leave you alone with people you don't know. They will press you to talk when you feel uncomfortable doing so. They will think there's a problem with you when you don't engage in the same activities they do. Well, this book can be a big help in describing to them what it feels like to be different from them. Of course, the book also helpfully reminds you that some extroverts do understand and they can be amazing friends. And lest you think this is nothing but a self-help book, rest assured the majority of it still relies on relatable humor for introverts, with the classic cutesy art style from Marzi's previous works. I recommend this book to everyone. For introverts it makes you feel understood and less lonely and for extroverts it helps you understand introverts better. This book is officially my new happy/safe space. I’ve followed Marzi for a while on Facebook, so this was essentially a meeting of two of my favorite mediums for escaping a world of non-anxiety-having extroverts: social media and books. If you have anxiety (or if you’re trying to understand someone who does), please pick up this book. You won’t regret it! 5.0 out of 5 starsIt’s like sitting with a friend that gets you.